Sonic's father, Bernadette's husband, and Uncle Chuck's brother, Jules is the first Mobian in history to be put through through the roboticizer. Jules had been badly injured in the Great War, and Charles put him in the machine to restore him, unaware that Dr. Robotnik had tampered with the machine. Robbed of his free will, Jules was rendered a mindless tool that Robotnik had the audacity to manipulate into roboticizing Bernadette. Ten years later, following Robotnik's fall, Charles sought his brother out and restored his free will, along with Bernadette and others. Jules rejoined his wife, and they joined the Freedom Fighter resistance against Robotnik. After Robotnik's demise, Jules and the rest of the "Robians" (roboticized Mobians) hid in the slums of Robotropolis. Soon afterward, he met his son for the first time in years. Unfortunately, Jules is having a rough time being a father, as his brother Charles is Sonic's established father figure. Adding to his problems, Jules is the last remaining Robian who has not been de-roboticized; When aliens known as the Bem used their technology to de-roboticize everyone on the planet, Jules remained trapped in his robotic state � excluding Bunnie Rabbot, who had previously upgraded her roboticized parts to the point of being symbiotic with them for health reasons, and removing them would kill her. Similarly, Sonic found out that due to his war injuries sustained before being roboticized, de-roboticizing Jules would prove fatal. Jules, NICOLE, and Bunnie were unknowingly infiltrated by nanites under the control of A.D.A.M. at the behest of Eggman, presumably for intelligence-gathering. A.D.A.M. later uses Jules in his own plan, which is set in motion when Jules kidnaps Tails and brings him to a huge 'city' built by the Nanites. Jules is then instructed to self-destruct once his task is complete, but Jules takes advantage of a loophole in the order in that A.D.A.M. didn't tell him when to self-destruct. He is able to hold off the process until A.D.A.M. is destroyed and his influence over Jules and the others is over. 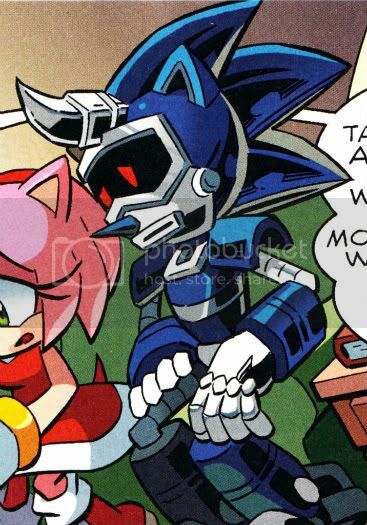 When Scourge attempts to sneak into Sonic's home in the middle of the night for a surprise beating, he is confronted by Jules, who, as a robot, doesn't sleep. Scourge attempts to intimidate him but is unsuccessful, as Jules deems him a coward and criticizes his actions. Scourge goes so far as to threaten to kill him, and Jules, unafraid, tells Scourge that as a former soldier of the Great War, he wouldn't go quietly, and that while he'd protect Sonic with his life, Sonic wouldn't easily forgive his death. Eventually Scourge is shaken by his words and leaves bitterly through the window, which Jules simply shuts behind him, telling his wife, who was awakened by the noise, that it was "nothing."